Our Houston dentist wants you to have a dazzling, healthy smile. Gentle Dental offers pediatric, family, emergency, general, cosmetic, orthodontic, periodontic, and surgical dental services at our office in Copperfield. From our location, we’re pleased to serve the communities of Copperfield, Bear Creek, Cypress, and Northwest Houston and Harris County. Regardless of your reason for coming to our office, we want you to have a positive, comfortable experience. 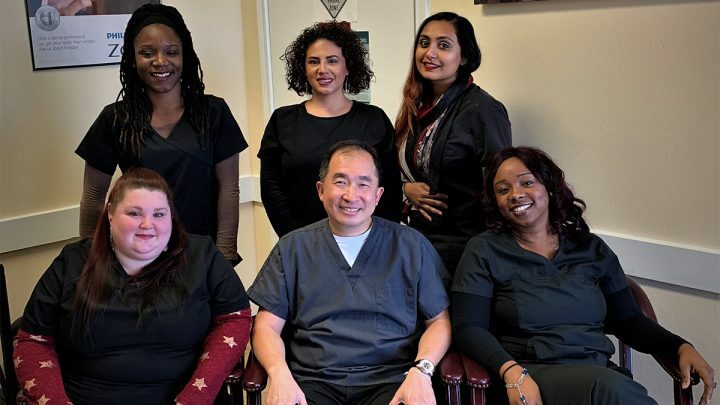 Our knowledgeable and caring staff of Houston dentists, specialists, and assistants are all here to help you get the smile you’ve always wanted while helping you maintain good oral health with pediatric, family and emergency services. A healthy mouth is beautiful! A beautiful mouth is healthy! At Gentle Dental Care, we want you to have it both ways! We offer a range of cosmetic dental treatments at our office, including teeth whitening, braces, and clear aligners. Never be self-conscious about your smile ever again. Even in as little as a single office visit, we can transform your smile from ordinary to extraordinary with in-office treatments such as ZOOM® whitening from Phillips. This incredible whitening technology can have your teeth up to eight shades whiter in only 45 minutes. Click here to schedule your cosmetic dental appointment. Whenever your teeth become unhealthy, it is usually due to advanced stages of oral diseases such as periodontal disease. Unfortunately, when teeth get to this stage, surgical intervention is required. At Gentle Dental, our oral surgeon takes great care to ensure the safety and comfort of the patient. Our ultimate goal is to make sure your oral surgery leads to better dental health later on down the road. Our consultations and analysis are thorough, and we want you to make sure you completely understand the process. Periodontal (gum) disease is an infection and irritation of the gums, leading to the damaging of tissue structures in your mouth that actually hold your teeth in place. Periodontal disease can be caused by poor maintenance of your oral health or, in some cases, hereditary issues. Our periodontist works to take decisive action to help save your teeth. Sometimes, however, not all teeth can be saved and one or more of your teeth may need to be extracted. An orthodontist specializes in the treatment of misaligned teeth and jaws, occlusion issues, and problems with your bite. This specialist focuses on providing treatments that straighten out your teeth. Some of the solutions include braces, aligners, palate expanders, among other solutions. At Gentle Dental, our Houston dentist analyzes your tooth and jaw structure to determine what would be the best pediatric, family or emergency service treatment plan. Left untreated, these issues can have a serious effect on your well-being, including affecting your ability to bite and chew. Click here to set your appointment.